One very serious medical symptom of illness in pet rats is mouth breathing. Pet rats need to breathe through their noses, and cannot sustain breathing through their mouths. Mouth breathing is often triggered by stress or other illness, and tragically can forewarn of death. 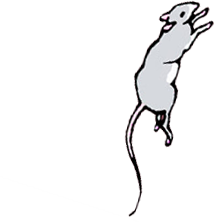 If your pet rat is breathing funny, take a look at this brief video and see what mouth breathing looks like. If your rat is mouth breathing, please seek veterinarian help for the rat. 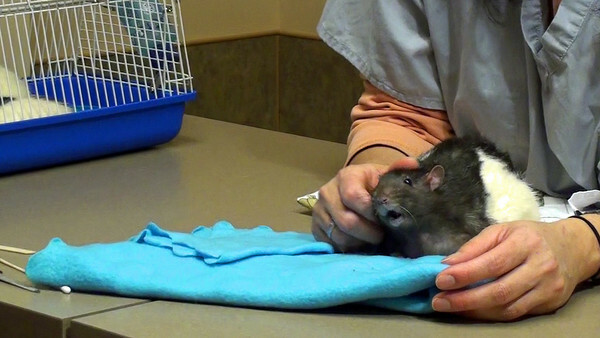 Crabpatty Rat was being filmed for a regular physical exam when he began to mouth breathe. Everything came to a halt to assess this problem. Luckily Dr. Anthony Pilny was right there to help, but Crabby did not have other medical symptoms to explain his breathing difficulty. With time and calming, his breathing returned to normal. This is not always the outcome of mouth breathing, which sometimes can be a sign of impending death.